BANGALORE: It was celebration of a different kind at Iskcon on Saturday. The temple celebrated Govardhana festival on its premises with a 1,450-kg vegetarian cake, a replica of the Govardhana Hill. The cake, of different flavours and topped with various cookies, was baked in the temple bakery. The festival commemorates the pastime of Lord Krishna balancing the Govardhana Hill on his little finger to protect his devotees and the residents of Vrindavana. The deity was decorated in Giridhari alankara, holding a small replica of Govardhana Hill on his left hand. Hundreds of visitors offer ghee lamps to Sri Radha Krishna-Chandra during the auspicious month of Karthika. 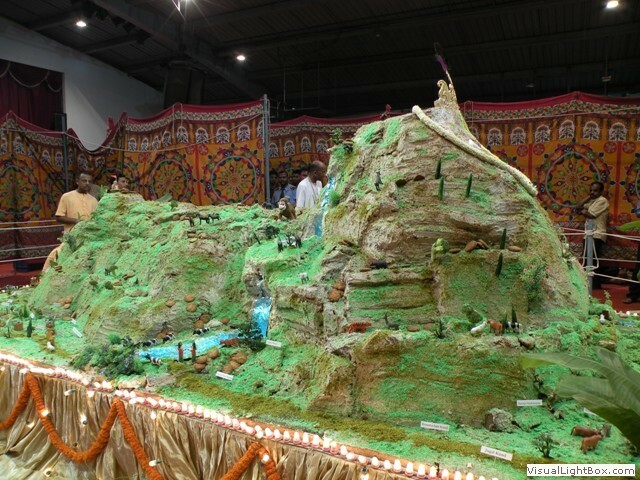 BANGALORE: ISKCON, Bangalore, prepared a cake weighing about 1,200 kg – resembling Govardhan hill – and worshipped it. As per legends in Vishnu Puran, people of Gokul used to worship Lord Indra for sending rains. But Lord Krishna told them that it was Govardhan hill and not Lord Indra who sent the rains and thus the latter should be worshipped. Thus the people started worshipping the hill, much to the anger of Lord Indra. An infuriated Indra lashed Gokul with heavy rain. That is when Lord Krishna lifted the Govardhan hill on his little finger and the people of Gokul took shelter under it. The 1,200-kg cake made at ISKCON resembles that hill. The fourth day of Diwali is celebrated as Anna Koot, which literally means mountain of food. On this day, people prepare 56 or 108 different varieties of dishes to offer Lord Krishna.